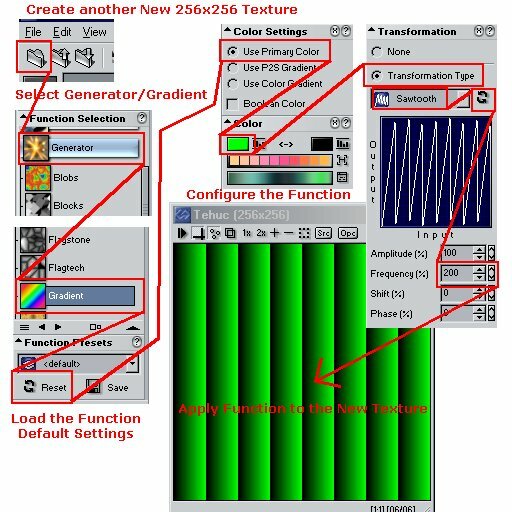 by Tobias Reichert (4.10.02) for Texture Maker v2.4+. 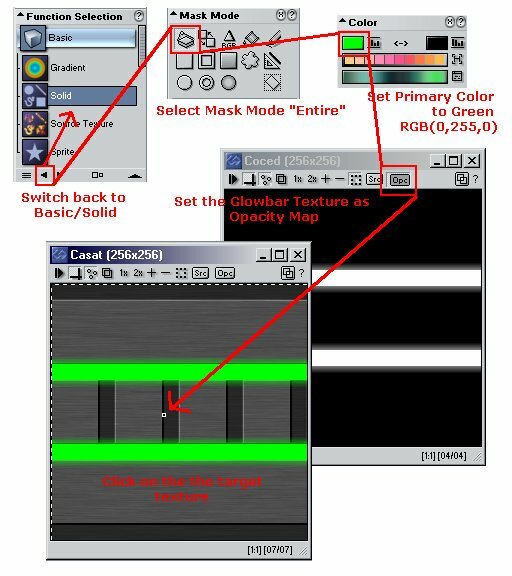 This Tutorial illustrates how to create a simple space station wall with green light bars scrolling from left to right. Let's start with a new texture. 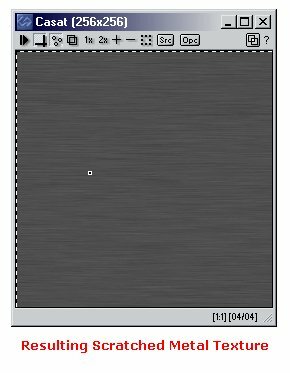 Click on the NEW button and create a texture with 256x256 pixels. 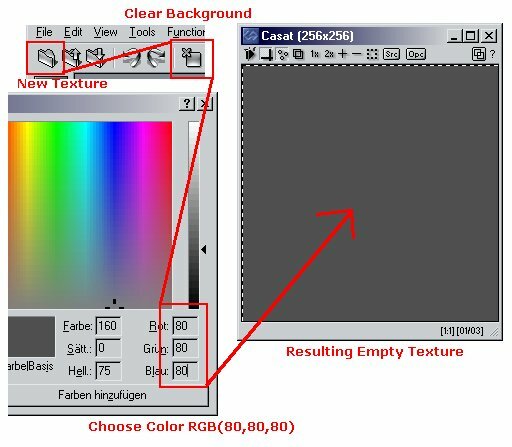 After this click on the Clear Background button and select the color RGB(80,80,80), a dark gray, at the upcoming color dialog. Select the function Noise/Scratch at the function selection and reset it to its default settings. This will make sure that you have the same settings that were used for this tutorial. You can see that the configuration panels at the right side of the interface change according to the selected function and preset. At the direction panel set the direction angle to 0 and the radius to full length by clicking on the right button. 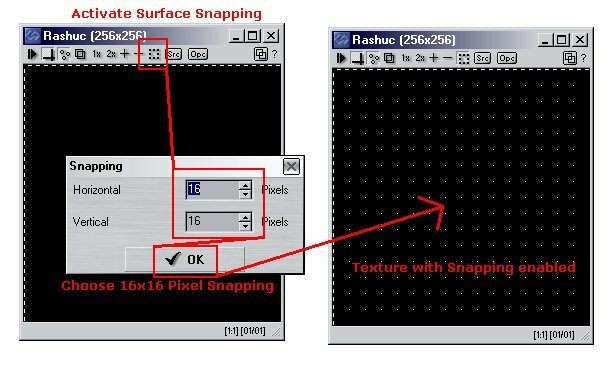 The opacity value should be set to 25% to lower the depth of the scratches. Now click two or three times on the texture to apply the function. Create another texture, also with 256x256 pixels. This time set the background color to black, RGB(0,0,0). On that new texture activate the Surface Snapping. Select the function Basic/Solid and also reset it to the default settings. Set the Primary Color to white, RGB(255,255,255). We want to draw rectangles, so we select the Mask Mode "Rectangle". Verify that your settings match those in the image below. Set the texture window size to 2x the texture size by clicking on the 2x button on the texture form. Try to draw the same rectangles like shown in the image below. 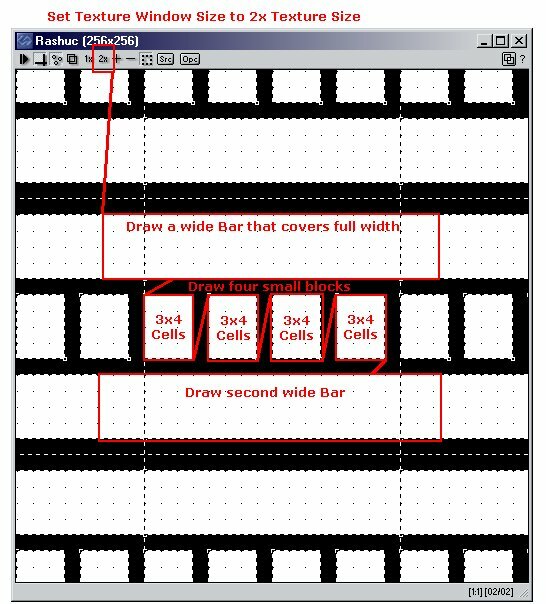 There are two bars that are four 16-pixel cells high and cover the entire width of the texture, and four blocks that cover 3x4 cells with one cell space between. We change the Primary Color to gray, RGB(128,128,128) and start filling the space between the 3x4 blocks with rectangles. After that we proceed and replace the black part below. To easily get a structure to our scratched metal texture we use the Quick Texture Mixer. 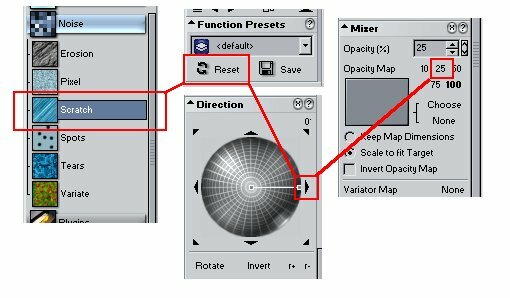 Click on the Mixer-Icon at the texture with our rectangles and drag it to the scratched metal texture. 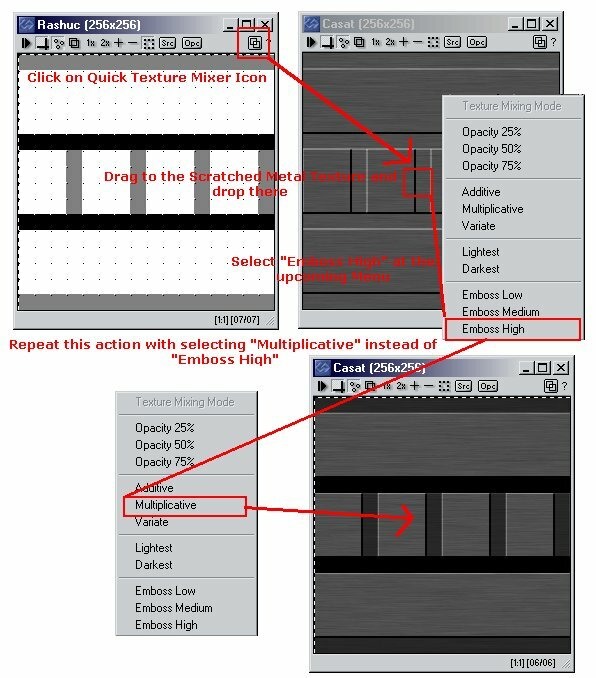 At the upcoming menu select the Texture Mixing Mode "Emboss High". After this repeat the process but this time select the "Multiplicative" mode. Your scratched metal texture should have the same structure like in the image below now. We need another texture now that will define where the green light bars will be placed. 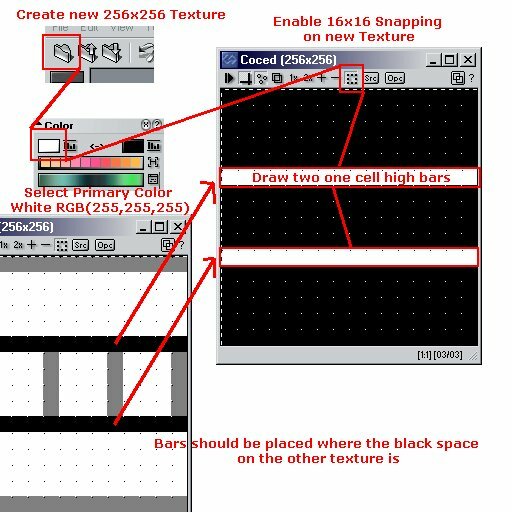 Create a new texture (256x256 pixels) with black background. Active Snapping again and set the Primary Color back to white. 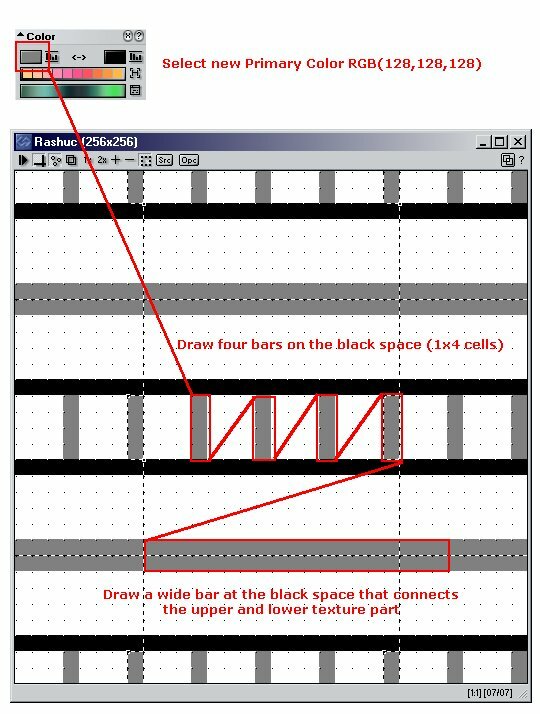 Now draw two bars that are placed where the black space of the other texture is. We make the two bars glow by selecting the Filter/Smooth function. 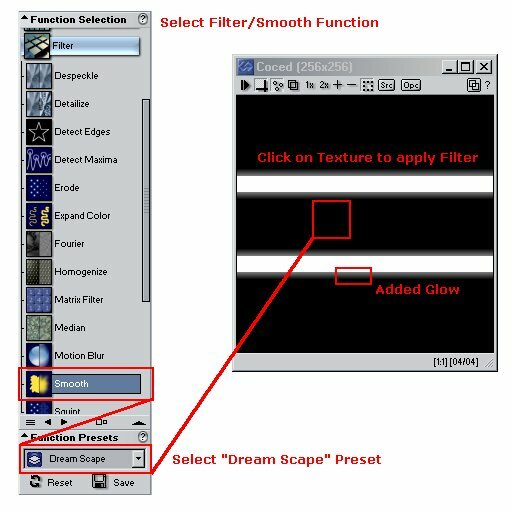 Activate the preset "Dream Scape". Now click on the texture with the two bars to apply the filter. We go back to the Basic/Solid function. You can do this easily by pressing the little back button at the function selection, because basic/solid was our last function. 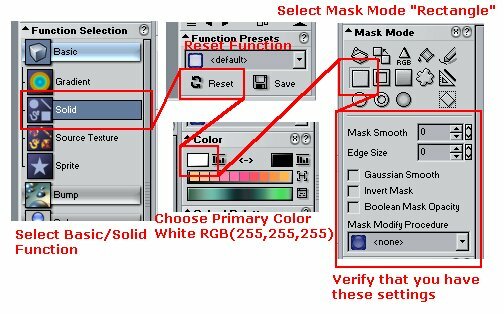 We want to apply this function to all of the texture now, so we select the Mask Mode "Entire". Set the Primary Color to Green, RGB(0,255,0). OK, we don't really want to make the entire scratched-metal texture green, so we set the texture with the two glowing bars as Opacity Map by clicking on the Opc button. Now we can click on the target texture and have black space filled with green glowing bars. The glow effect is not needed anymore, so we activate the two-white-bars texture and press the Undo button. 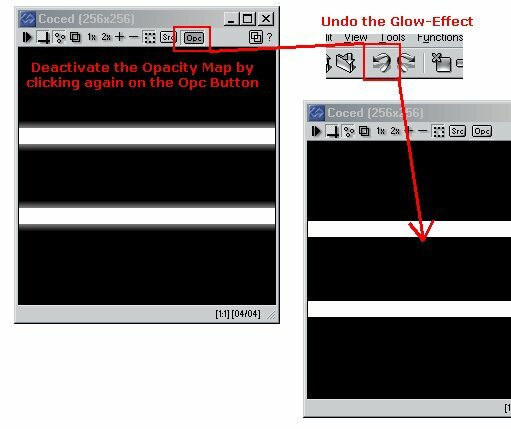 For the next function we also don't want an opacity map, so we press the Opc button again to deselect the map. Now the green light bars are created. 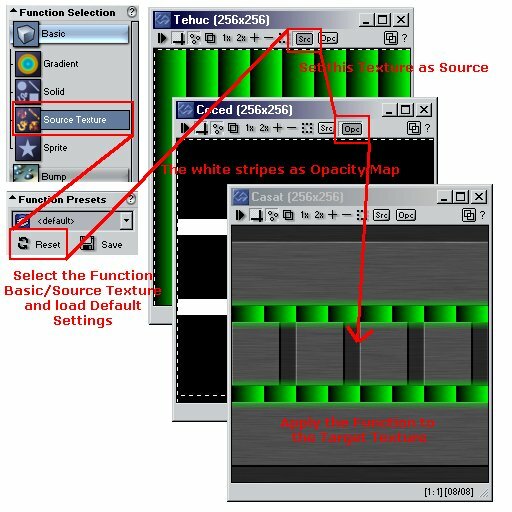 Open a new texture and select the function Generator/Gradient. Load the default preset. Set the Color Settings to "Use Primary Color" and the Primary Color to green, RGB(0,255,0). This will give us gradients from black to green. We want eight thin color gradient from left to right, so we select the Transformation Type "Sawtooth" and set the frequency to 200%. Verify that the other settings match those in the image below. Now click on the new texture to apply the function. The green gradients are now inserted into the target texture. Select the function Basic/Source Texture and load the default preset. Set the gradients texture as Source, the white-bars texture as Opacity Map and then click on the target texture. We now have the static version of what we want to animate. 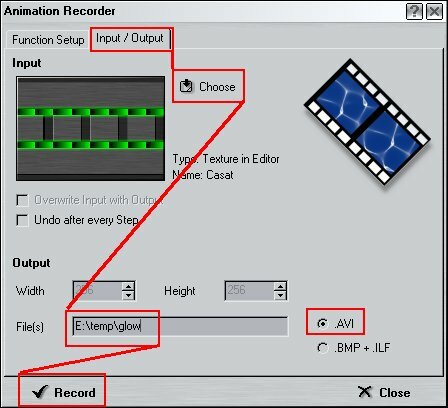 For simple animations the Animation Recorder, that is located at the Tools Menu, is your friend. Open it and set the Framecount to 32. By clicking on the Menu button you can select the configuration variable Source Offset X. You can also type it yourself. In the field right to the "=" character enter the string "-frame". 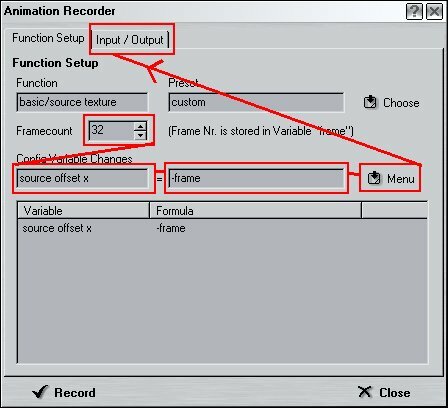 This will make the recorder compute the "source offset x" value for each frame. The value defines the shifting of the source texture (in this case our green lightbars) to the left. Because we want to shift to the right we have "-frame" (negative values). Make sure that you have added the Variable and Formula to the lower list (by pressing the menu button and selecting "add"). We want to work with our scratched metal texture, so we choose it as input (select "texture in editor" in the upcoming menu after pressing "choose"). The remaining settings to be done are the output filename and the extension (Choose .AVI). Now press record and find the ready-to-use animation at the defined destination. Click HERE to download the resulting animation.